OR-17 with a 2013 pup of the Imnaha pack (photo by ODFW). Extermination. Seen as incompatible with the settlement of the West, the gray wolf was trapped, poisoned and shot by state and federal governments and private bounty hunters to the point of near extinction. Protection. The species has been listed on the federal Endangered Species Act since the 1973. However, as of 2019 these protections are currently under threat – learn more. Recovery efforts. 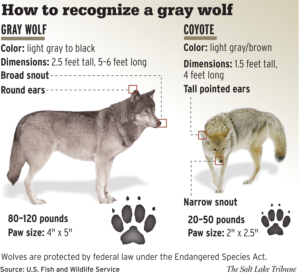 To expedite recovery in the Rocky Mountains, the US Fish and Wildlife Service, the federal agency in charge of recovering endangered species, seeded central Idaho and Yellowstone National Park with 29 gray wolves from nearby Canada in 1995 and 37 more in 1996. As anticipated, wolves have repopulated the northern Rockies and have migrated to neighboring states where recovery has begun in earnest. In 1999, three wolves journeyed into Oregon from Idaho. One was shot and killed, one was hit by a car and killed, and the other was tranquilized and sent back to Idaho. Because the state has a statutory obligation under the Oregon Endangered Species Act to recover the gray wolf, the Oregon Department of Fish and Wildlife convened diverse stakeholders to generate a gray wolf recovery plan in 2003. During the planning process, Cascadia Wildlands mobilized community members across the state, testified at hearings, hosted presentations and submitted official comments on the plan. The plan was adopted by the Oregon Department of Fish and Wildlife Commission in 2005 and set recovery goals for the species in both eastern and western Oregon. End-of-year 2018 counts in Oregon documented at least 137 wolves across approximately 16 packs and/or pairs. In Washington, the 2017 count came in with at least 124 wolves across 22 packs. 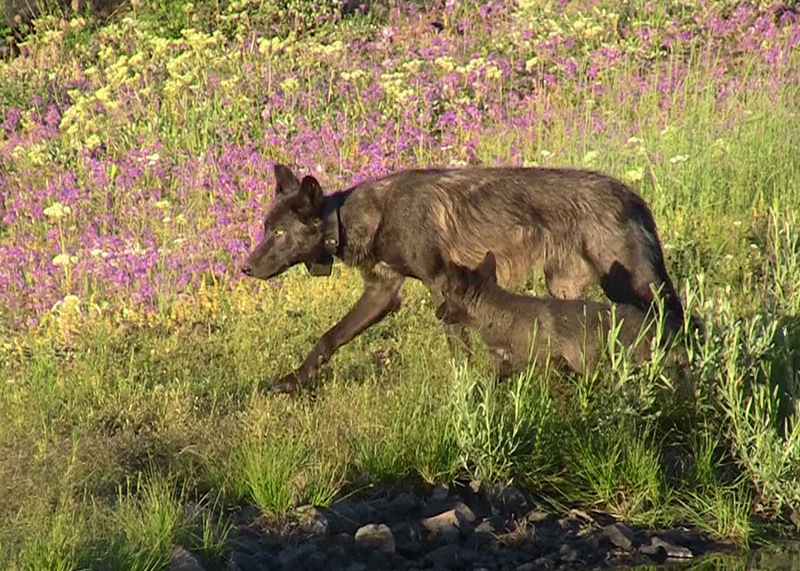 In California, the lone Shasta Pack has established a territory near the namesake volcano. 1. “Wolves and the Ecology of Fear: Can Predation Risk Structure Ecosystems?” By William Ripple and Robert Beschta. This article details the impacts wolves have had on Yellowstone since their reintroduction in 1995, including elk herds and riparian vegetation. 2. “Is the Return of the Wolf, Wolverine, and Grizzly Bear to Oregon and California Biologically Feasible?” By Carlos Carrol, Reed Noss, et al. 3. “Modeling Gray Wolf Habitat in Oregon Using a Geographic Information System.” Abstract of thesis by Tad Larsen. 4. Article on the Potential for Wolf Recovery in Oregon. By George Wuerthner.